Enjoy this magical yoga, dance, culture and nature retreat in Newgrange & Connemara, Ireland. Yoga, dance, spectacular views, ancient sites, places of power, music and walking through the rugged and mystical landscape of Connemara. A relaxing and peaceful retreat to recharge and restore your body, heart and soul. 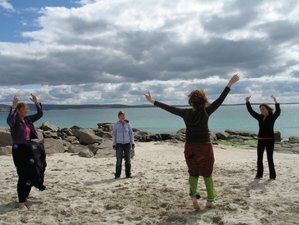 During 'The Celtic Heartbeat' you experience the magic and the heartbeat of mother earth in the rugged Irish landscape. During this week you will have the opportunity to reconnect with your own heart and essence and to relax, recharge and get inspired. The retreat will be given in English or Dutch, depending on the nationality of the participants. During the retreat you will stay two nights in the Boyne Valley in Drogheda and four nights in the Anglers Return in Roundstone. The first two days you will stay in the Boyne Valley, Drogheda, just north of Dublin. Here you'll visit Newgrange, Knowth, Dowth, the Hill of Tara and the Holy Well of Tara. The megalithic monuments of Newgrange, Knowth and Dowth are one of the oldest in the world. They are older than Stonehenge and the pyramids of Egypt. In these megalithic passage tombs you will find very special spiral rock inscriptions. Initiations took place with regard to the Mother Goddess Danu. These monuments were erected by the gods, the Tuatha-de-Danaan, according to the stories of the people of Atlantis. In good weather you can do yoga or meditation on the Hill of Tara (Temhair in Gaelic). It is a place that was already a place of worship 3200 years before Christ where magical rituals were performed. There are many Irish stories about Tara. You feel the magic when you stand on this spot. You can also feel the power of 'the Stone of Destiny' (Lia Fáil in Irish) on the Hill of Tara. It was believed that the stone would scream so loudly that it would be heard throughout Ireland when the true king of Ireland came near. From the Hill of Tara you have, on a clear day, a spectacular view of about 25% of the Irish landscape. After visiting Newgrange and Tara you'll travel to the west coast of Ireland, where you can enjoy the primal energy of Connemara and yoga on the beach (weather permitting). In Connemara you'll stay at The Anglers Return, a special and authentic country house in the middle of the rugged, untouched and magical nature. This house, at the foot of Derradda Hill, is surrounded by 14 acres of natural woodland gardens, with an orchard and organic vegetables. It overlooks the peaceful Ballinahinch river and lake. A few steps away there is a spectacular view of the “Twelve Bens” and the “Maam Turk” mountain ranges. The Anglers Return in Connemara is a beautiful place where life is closely linked to the elements. The week is filled with magic. At the Anglers Return, you start before breakfast with a yoga workshop and continue after an organic breakfast with another workshop. This could be yoga, dance meditation, dance expression, painting or any other interest that appears to be needed by the group. In good weather you can also use the beautiful garden or the beach for the workshops. Two afternoons are free for walks, relaxing and enjoying the beautiful surroundings. You'll complete the rest of the afternoon program on the spot, taking into account the offer of the moment and the needs of the group. I am a therapist, a teacher in heart yoga, Dru yoga, and dance and a teacher trainer for Movement Dynamics and Touch for Health. I have taught hundreds of people in the Netherlands, France, Ireland, Aruba, Curacao and Bonaire and have worked with the DISC communication model as a coach / trainer. From a holistic point of view and with much pleasure, I give heart yoga, Dru yoga, dance, and massage and I am your guide on inspiring yoga and dance retreats and holidays, that bring body, heart, and soul together. The retreat takes place in Newgrange and Connemara, Ireland. During the retreat you will enjoy a daily breakfast and two dinners. In the Anglers Return there's a nice kitchen available, where you can cook or prepare your own lunches and picnics. The first few days you will have lunch and dinner in restaurants. Please book your flights to the airport of Dublin (DUB). Airport transfer can be arranged by the host. Please contact the organizer for more information about costs. Airport: Dublin Airport Airport transfer available: Dublin Airport (US$28 per person) Additional charges may apply. You can request this in the next step. Yoga in Lochem organizes wonderful yoga retreats and holidays on stunning locations.